This stunning hilltop ranch is one of a kind. It is high-fenced, infused with superior whitetails, and wooded with a mix of hardwoods and pine plantations. The manicured ranch boasts two complementary ranch style homes with far-reaching views sitting on top of the 650 high peak, and it is located just southeast of Palestine. This turn-key trophy ranch is priced competitively for the market and is ready for springtime enjoyment. Approximately $300,000 value in plantation pine. The ranch is located in south central Anderson County, approximately 7 miles outside of Palestine. The drive is approximately 2 hours from Dallas, and 2.5 hours from Houston. It is accessed by paved Anderson County Road 153, which brings electric and water utilities as well as underground internet and phone service. This ranch has one of the highest peaks in Anderson County, and this substantial hilltop has been groomed to allow for very far views in all directions; absolutely unmatched anywhere in Anderson County. There are two valuable pine plantation stands of approximately 155 acres on the north side of the ranch and 69 acres on the south that have been professionally managed by Mike Cline Forestry. These supplement the overall value of this ranch asset and also provide some potential tax advantages for the next owner. The balance of the acreage is comprised of a good blend of pines and other hardwood species for a diverse forage base and mix of cover for wildlife. There is a good road system throughout the ranch, yet most of the acreage has remained untouched for wildlife. The soils under the ranch are from the Cuthbert, Bowie, and Kirvin formations in the Western Coastal Plain soil region. These soils are highly weathered and acidic and support pine-hardwood vegetation, typically characterized by loblolly pine. An additional 24+/- acres can be included in the sale of this ranch for a total of 520 acres, at $3,170,000. Click here to view an interactive ranch hunting map. The whitetail deer population is healthy and abundant across this high fenced game ranch. The owner introduced over 30 genetically superior deer from east texas breeders Briar Lakes Ranch and Windy B Ranch into the property approximately 10 years ago, and he has carefully managed the wildlife since then. (See photo of a few of the breeder bucks.) Most of the native deer were trapped and removed at the time of this initial stocking. Although this ranch is set up well to also be a commercial hunting property, it has only been hunted and used recreationally personally by the owner. The ranch was stocked once with quality whitetail deer but it has never been a deer breeding facility. It is currently classified as Level 3 in the Texas Managed Land Deer program, which provides for an extended hunting season and additional deer management opportunities through Texas Parks and Wildlife. There are over 5 miles of galvanized high fence around the perimeter of the ranch, complete with additional varmint guard wire buried two feet underground. This game fence is in excellent condition: there are no hogs on the ranch! There are two ranch style homes on this ranch and they are made in the same construction style, with similar materials, and by the same builder. They are in excellent condition and have been very well maintained. 2015 home: 2,500 square feet of living area, not including the wrap around porch. This home has 3 bedrooms and 2.5 baths, an office and workout studio, and of course the main living room and dining room. The living and main dining area is open to the second floor ceiling and the entire house has large windows with views out over the hilltop areas. The wood paneling is very comfortable and welcoming as well. 2007 home: 1,592 square feet of living area, not including the wrap around porch. This home has 2 bedrooms and 1.5 baths and makes for an ideal guest home. 2014 fully enclosed workshop: 1,650 square feet with the overhang. It has concrete flooring, and is stubbed out for future plumbing, and a walk-in cooler drain. 2006 fully enclosed workshop: 2,000 square feet with concrete flooring, and full utilities. 2006 mobile home: 14’ x 60’. It is currently used for a ranch foreman’s home. Another value asset to the ranch is the deep and very productive water well, which historically produced approximately 450 gpm out of the deep Carrizo-Wilcox formation. The Camp Hill water well (TCEQ# 3820604) was drilled in 1968 to 1,840’ for a former oil and gas operator, and is approximately 13” in size. An existing well of this size can be advantageous not only because it would be very expensive to permit and drill, but it can also be used to irrigate and to supplement future water features on the ranch. Some have also considered this well to be the most prolific well in the area due to its location on the higher part of the hill and the gravity flow potential that comes with it. This well is currently not in use, and was recently supporting the landscape irrigation for the main house with a small solar pump. The ranch is within the Neches and Trinity Valleys Groundwater Conservation District. 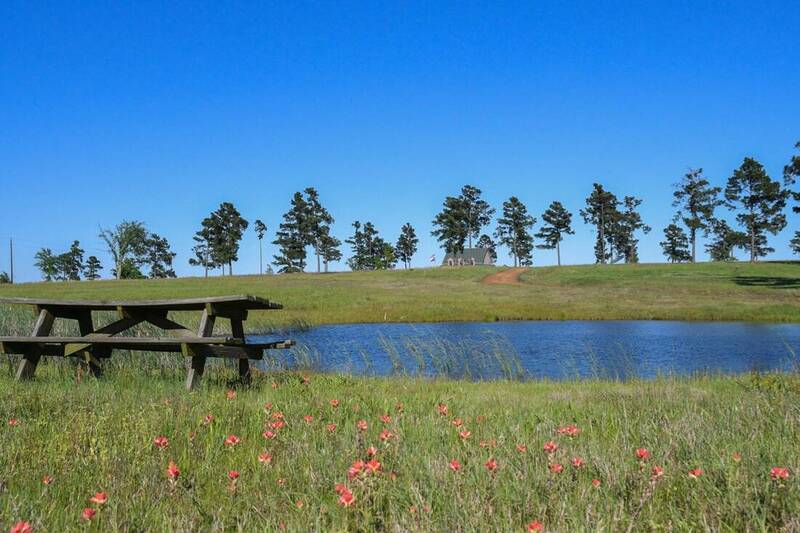 There are a few ponds scattered throughout the ranch, and the largest is approximately 4 acres in size. It is stocked with bass and bluegill, and has a wooden swimming dock and concrete spillway. The homes and barns are serviced by both well water and community water, and the ranch gets an average of 40” of rainfall annually. There is no production on the ranch, and the owner does not own any of the mineral estate. Note that there are several old well locations that produced in the past and may show up on older aerial maps, but these have been plugged and abandoned, and the surface was remediated to its natural state. There is one easement on the ranch. It is a buried gas line and is on the far eastern edge of the ranch. Multiple hand tools and tool boxes.